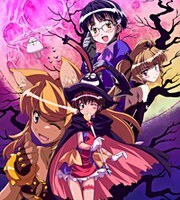 Plot Summary: Four Netherworld Princesses have come to the human world: witch Uma, vampiress Pachira, werewolf Liru, and android Aiko. But they know nothing about human life and their mistakes make up their daily adventures. Meanwhile, the evil Dr. K-ko wants proof of the supernatural to gain admittance into the scientific elite and what better than one, or all, of the princesses—if her plans didn’t have a tendency to go awry.